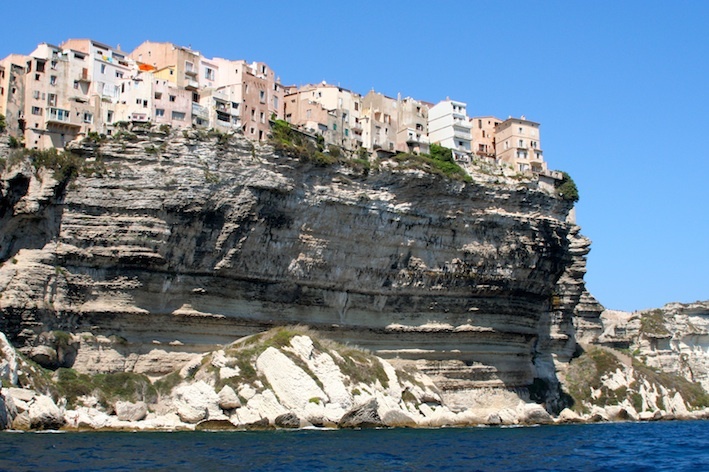 This route is the first 60 km of the 2013 Tour de France with one exception as the peloton will not be visiting the southernmost point of Corsica, Bonifacio port. Whilst there are no especially tricky climbs to negotiate it is undulating all the way but, having said that relatively easy. Unlike most of my routes this one has a longish spell on the main road south so extra care is needed. Leaving Porto Vecchio on the T10 (N198) signed Bonifacio. After a km or so you should spot a sign for Route de Piccovagia on the left - not as shown on my map but this is an optional excursion that takes in the beautiful and famous beach at Palombaggia. If it's not August then it's well woth doing. It rejoins the long straight that is the N198 just a few kms south. This loop also forms part of the Critérium International course. The Maquis - the green low lying shrubbery - in these parts is dense and very aromatic. Rumour has it that when the wind was blowing from the west Napolean (born in Ajaccio), who was exiled to the island of Elba in 1814, could smell the maquis from his beloved Corsica. The Tour won't actually enter Bonifacio and it will be apparent why when you get there. It's worth a stop to explore a little even if it's just a meander along Quai Comparetti. This is a stunning and narrow harbour with the old town and citadel rising up on one side and the maquis covered cliffs on the other. My picture above shows a view that you can't get from your bike, unless you get very wet. The houses of the old town clinging to the edge of the cliff tops which are steadily eroding away below. Most of the route remains and it's very pleasant following the way the Tour will go until you return to Porto Vecchio. Leave Bonifacio climbing on the T40 (N196), right onto the D859 for Figari village (NOT the airport) and then the left fork onto the D59 for a short distance and then right onto the D159, then the D659a into Porto Vecchio.